Your teeth are meant to be bright and beautiful, but lifestyle habits and even normal aging can result in yellow teeth that take the sparkle out of your smile. Fortunately, many over-the-counter and professional treatments are available to lighten stains and restore your self-confidence. Some rely on polishing agents or mild abrasives, but most use peroxide-based bleaching agents. At-home dental whitening kits can produce results after continued use for a month. Some in-office professional treatments work in only one visit. Before you buy a product or schedule an appointment with your dentist, make sure you are aware of potential side effects. At-home tooth bleaching products have a safe track record, and only two side effects are generally associated with them. The most common side effect is a temporary increase in tooth sensitivity. People who already have sensitive teeth are more likely to find treatments uncomfortable. Sensitivity usually occurs in the early stages of the bleaching process and disappears within one to three days of stopping treatment. The other side effect is mild irritation of the gums and soft tissues of the mouth; this may be related to a poorly fitting mouthpiece or tray. Like sensitivity, it goes away soon after discontinuing treatment. An advantage of choosing a dentist teeth-whitening treatment is the dentist’s ability to supervise the procedure and reduce the risk of side effects, or prevent them entirely by using protective pastes or rubber shields. Teeth bleaching whitening systems that have received the seal of acceptance by the American Dental Association (ADA) have met established safety and effectiveness guidelines. Only professional, dentist-applied whitening treatments have received the seal so far. The ADA does not endorse home whitening kits because the organization believes professional consultation should always be sought before performing whitening procedures. Not all manufacturers seek approval from the ADA, so not having the ADA seal of acceptance does not necessarily mean a product is unsafe. 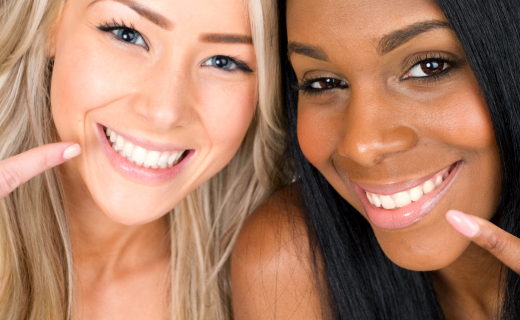 To learn more, talk to your dentist in Philadelphia about your dental whitening options. Everyone at gentle dental are very nice and they take awesome care of there patients. Dr M is wonderful: kind, friendly, calming. My appointments are always on time and o leave feeling great. Excellent customer care. The staff is outstanding and very caring. They are efficient and pleasant. No long waiting period. Everything was great from making the appointment, to the reception and most definitely the care. Very Fast service been going here over 10 + years good report with staff always very pleasant! Dr Valentine is a great dentist. She cares about each of her clients. I feel that I get the proper dental care that I need and am not upsold or lied to in order to bill my insurance.